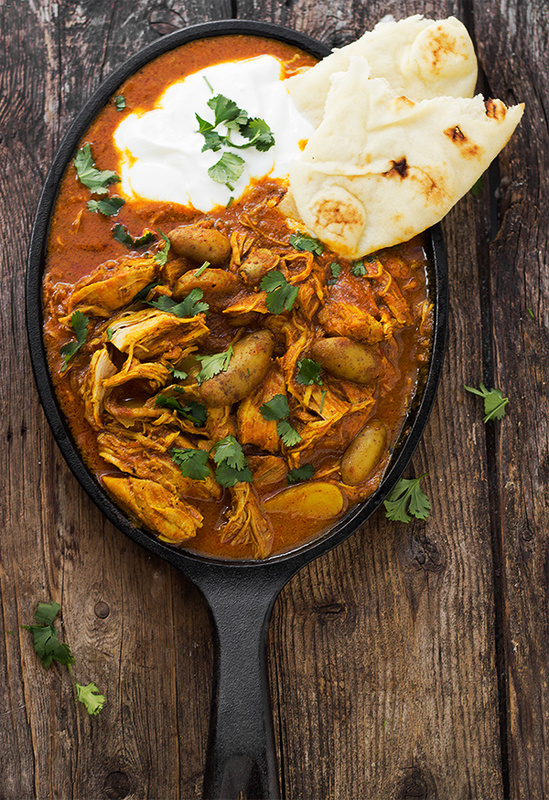 A delicious Indian Spiced Chicken Stew, with potatoes, tomatoes and a blend of Indian spices slow cooked for a complete and comforting meal. 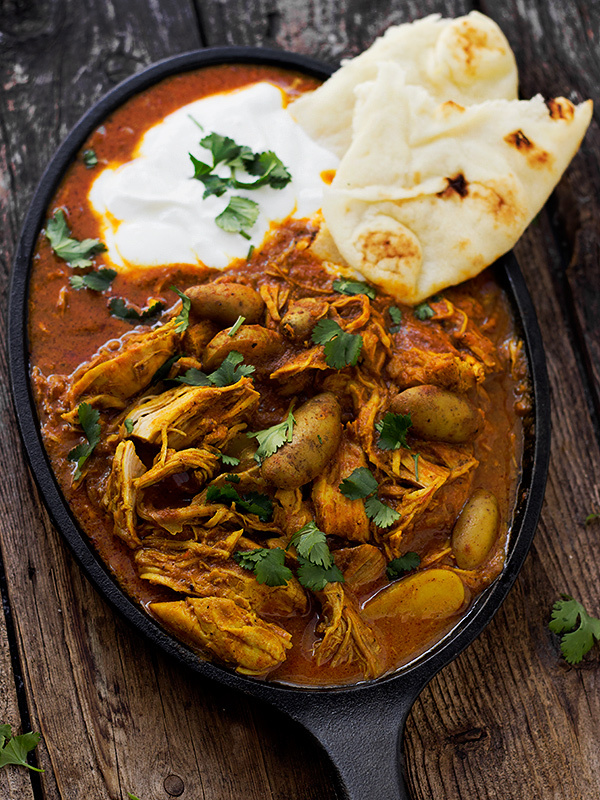 If you’re a fan of dishes like Tikka Masala or Butter chicken, you will love this one! I spied this Indian Spiced Chicken Stew in the latest Bon Apetit and immediately slotted it in for an upcoming meal. We enjoyed it for dinner last night and it was a big hit. It’s flavourful, hearty, warming and spicy and a great “throw everything in a pot and let it cook all afternoon” kind of dish. The spicy tomato and cream sauce was delicious and plentiful, great for sopping up with the naan bread. I also loved the addition of potatoes to this dish (and I wasn’t sure I would). All in all … everyone agreed it’s a keeper! This stew has a great combination of spices that work beautifully together. Don’t be intimidated by the long list. They are pretty common spices, so if you’re spice rack is fairly well-stocked, you’ll be good. The cayenne pepper provides some nice warming heat in this dish. You may want to use the lesser amount of cayenne or leave out altogether if you’re not a fan of heat or if you’re feeding small kids. Serve this stew with a big dollop of plain yogurt, some naan bread and a generous sprinkling of fresh mint (most traditional), cilantro or parsley. Alternately, this would be lovely spooned over warm basmati rice. I made this dish on the stove-top in my Dutch oven, but you could very easily do it in your slow-cooker. I used a couple of bone-in/skin on chicken breasts and thighs and took the chicken off the bone before adding the potatoes. Boneless, skinless chicken breasts or thighs would also work. You’d save the step of taking the chicken off the bone, but I do think the bone and skin probably add nice flavour to this one. Heat vegetable oil in a large Dutch oven over medium heat. Season chicken with salt and pepper and place skin side down in to the pan. Cook until golden brown without turning, about 8–10 minutes. Transfer chicken to a plate. To the same pot, add onion, garlic, and ginger to pot and cook, stirring occasionally, until onion is very soft and golden brown, about 8–10 minutes. Add tomato paste, garam masala, cumin, turmeric, coriander, cayenne and cook, stirring often, until tomato paste is beginning to darken, about 4 minutes. Add chicken pieces, chicken broth, tomato purée, and cream to pot. Season with salt and pepper and bring to a boil. Reduce heat and simmer, partially covered, until chicken is almost falling off the bone and liquid is slightly thickened, about 1 1/2 hours. If using bone-in chicken, remove chicken to a plate and carefully remove chicken from the bone and discard skin and bones. Cut or pull chicken into bite-sized pieces. Return chicken pieces to the pot. Add potatoes to the pot and cook, partially covered, until potatoes are fork-tender and sauce is thickened, 30-45 minutes. *Check and stir every so often to ensure the sauce hasn't thickened to much and potatoes aren't sticking to the bottom of the pot. If sauce is too thick, thin with a bit more chicken stock. To serve, spoon stew into a shallow bowl and place a large dollop of yogurt on one side. Sprinkle with some fresh chopped mint, cilantro or parsley and serve with naan bread on the side. Alternately, spoon stew over some warm basmati rice. I made it with chicken thighs and it was great, and a lot faster than the skin on breasts. Thanks! Yes, lovely with thighs as well, for sure :) Thanks! Made this yesterday and we loved it. I was super busy and needed something simple to throw together while doing stuff around the house. Comforting and delicious!!! LOVE your recipes, everything I have tried is almost immediately added to my favourites and is incorporated as part of my regular rotation. We jazz things up to suit our specific tastes, but tweaking is really not required. Restaurant worthy in almost every case depending on effort in presentation. You have inspired me and helped me to get over a hurdle of feeling like I didnt have time to do the kind of cooking I wanted. With a little organizing on the weekend, your recipes knock it out of the park during the week. Thanks for sharing, you have certainly made a difference in my life. Thought you should know. So glad you enjoyed this, Kristine! And thanks so much for your kind words :) I really appreciate it! I spent many of my busy years feeling the same way, until I just forced myself to cook from scratch and found it really doesn’t take much more time at all. And it’s so much more delicious! And that’s exactly what I wanted to share here. This recipe was awesome! We are doing the slow carb diet, so I didn’t us the cream, and I used lentils instead of potatoes. I also added chickpeas and spinach for the last half hour. It smelled amazing, and tasted even better! So homey and especially great for a cold evening in! So glad to hear, Teresa :) Thanks! I absolutely loved this recipe, and served it up in a giant Yorkshire pudding, a variation on the South African bunny chow. So glad to hear, Laura and I love the idea of serving it with Yorkshire! I’m going to try that next time :) Thanks! Hi, I’m Kerstin from Germany. 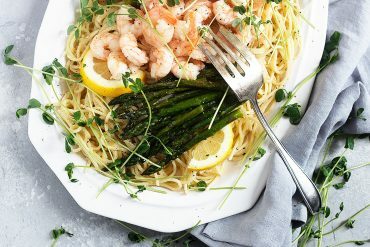 We are on vacation in France right now with our caravan … found your recipe browsing on pinterest today and just finished dinner with my husband. 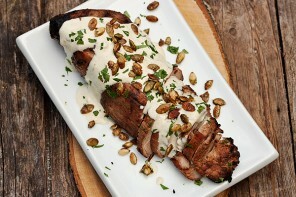 This dish is absolutely gorgeous! It’s really worth travelling around the world thanks to the internet. Thank you for sharing it!! I wish I was in a caravan in France! So glad you found this and enjoyed it on your travels :) Thanks! Do have to use cream. Is there a substitute? Hi Kim, You don’t say why you don’t want to use cream, which would be helpful. If you are avoiding dairy, you could use stirred coconut milk. If you are asking because you want to use a lower-fat dairy product, I would tell you that cream is specified over other dairy, since the high fat content prevents it from “breaking” when it contacts acids, like tomatoes. So lower fat dairy isn’t recommended. You could also just skip and have a non-creamy version, if you prefer. This was so delicious! My fiance and I both thoroughly enjoyed this stew. The only thing I had trouble with was my potatoes were a little under-cooked at the end & were stick to the pot. I should have added a bit more chicken stock toward the end & let it cook a little longer….very easy fix. We will definitely be adding this recipe to our regular rotation. Thank you! So glad you enjoyed this! Thanks :) And yes, a little more stock will fix that for sure. I’ve found some potatoes just absorb more of the liquid than others. I made this tonight and it was simply DELICIOUS. The family loved it too, so double win. I added a couple pinches of fenugreek at the end, but otherwise made exactly as written. This recipe is going into my favorites for sure. I made this exactly as written and it was absolutely delicious! 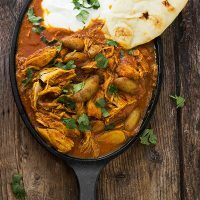 My husband stumbled upon this recipe when he was searching for an Indian chicken curry recipe, and boy am I glad he did. 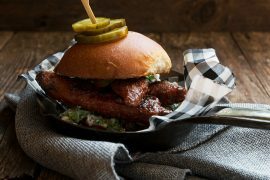 Love your website and your pictures do a wonderful job of showcasing the food. Thanks so much, Anna :) I love the warm flavours in this one and am always surprised at how well the potatoes work here! Thanks Candy and so glad you enjoyed this. One of my favourite dishes! Hi Jennifer! I love Indian food!!! I can’t wait to try this. The photos from the recipe – is that what you cooked it in or what you served it in? 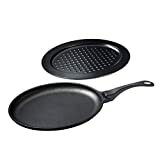 (the oval-shaped pan). I love the pan!!! Hi Denise :) I actually cooked this in my Dutch oven, then spooned it out on to these pans. They are Lodge, I think. Cast iron. Intended for fajitas, I think. I just find them a nice way to serve other things, too. Makes dinner more fun! Jennifer … fabulous mixture of spices. I am making it in the crockpot with frozen boneless skinless chicken thighs and adding coconut milk and greens at the end. Delicious!! Thanks for sharing! Thanks Susan and sounds great! Let me know how it works out in the slow cooker! This is hands down one of my favorite recipes. I return to this post over and over again. So good, thank you!! So glad you are enjoying it Kelly :) It’s a favourite of mine, too! Thanks so much for sharing this recipe! So warm and comforting. I made it for the first time when I was 40 weeks pregnant (and some change!) and those spices REALLY hit the spot. I had leftovers to put in the freezer too! This is definitely a keeper for me.